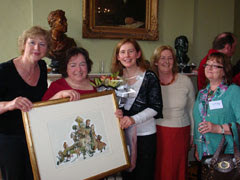 I wanted to mark the fact that this year’s Children’s Books Ireland Award went to my old friend Rosemary Hetherington, children’s librarian in Dublin City Council’s library service, in recognition of her outstanding contribution to the world of children’s books. “Within the libraries, in classrooms and alongside parents and teachers she has worked tirelessly to promote children’s books over the years – and continues to do so. It is precisely this kind of dedication – which can be a hidden feature of the work that goes on day after day – to ensure that as many children as possible encounter and come into contact with books that this award seeks to recognise” commented Jane O’Hanlon, Chair of CBI board. 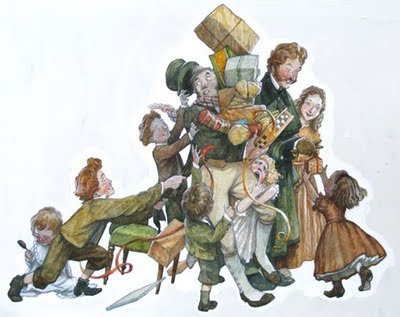 I would like to add my sincere congratulations to Rosemary, who was delighted, I am very pleased to say, with the original illustration of mine from A Christmas Carol that CBI generously presented to her.